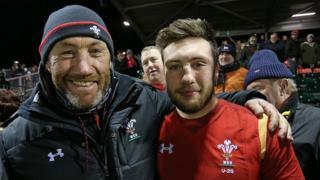 Wales forwards coach Robin McBryde watched son Billy come off the bench to kick the winning penalty as Wales Under-20 beat their Scottish counterparts at Colwyn Bay. The sides were tied at 15-15 when the Scarlets fly-half had the chance to seal victory at the end of a tight game. It was the Wales youngsters' second tournament win after an opening triumph over Ireland Under-20.